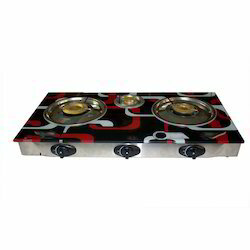 We are one of the Leading Manufacturer Supplier and Importer of Gas Stove like LPG Stoves, Crystal Gas Stove , Three Burner Gas Stove and Two Burner Gas Stove. Classy in design and superb in performance, this 3 burner gas stove from ILU is designed for your kitchen. The toughened glass cooktop not only looks good but is also strong and durable. The low gas consumption brass burners come in small, medium, and large sizes making it not only fuel efficient but also convenient for use as per one's need. The highlight of this gas stove is its auto-ignition function which makes it trouble-free to use. So if you are looking for a gas stove for your new home or planning to upgrade your old kitchen stove to a swanky new one, then this stylish and feature-packed gas stove is the right one for you. Go ahead and get your own gas stove now.